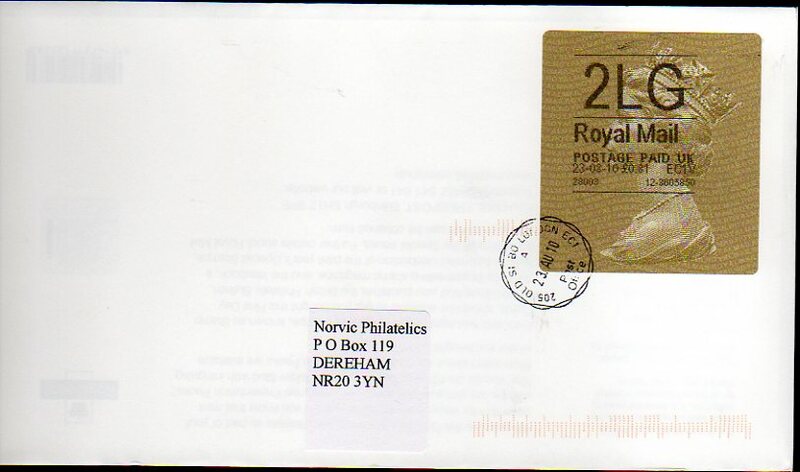 The seven stamps are self-adhesive as usual, with the 1st & 2nd also being available in booklets of 12. 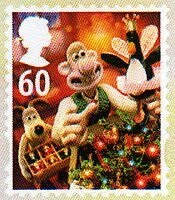 The miniature sheet is conventionally gummed, and also depicts children's favourite, Shaun the Sheep, so good he has his own tv series. There will also be the usual Smilers Sheet, this time featuring Wallace’s Stamp-O-Matic machine. To see this, visit our website. 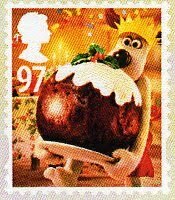 Royal Mail worked closely with creator Nick Park and the team at Aardman Animations in the genesis of the designs. 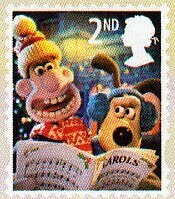 The approach to the stamps was similar to how Aardman create a film. 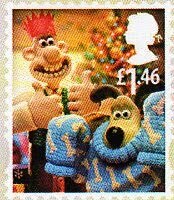 First Nick Park drew scenes and visual jokes involving the characters, refi ning the designs to work in miniature. After many such roughs a core of scenes was agreed upon. 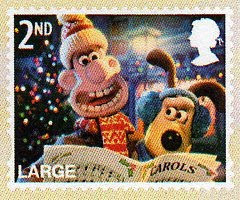 When he and Royal Mail were satisfi ed they would reproduce in a very small format, Nick Park created coloured versions of the illustrations which were reduced to stamp size. Then the Aardman model-makers were brought in to make the illustrations come to life, with Nick Park overseeing production. Each stamp was created like a scene from a film, with models, props and background sets especially constructed. 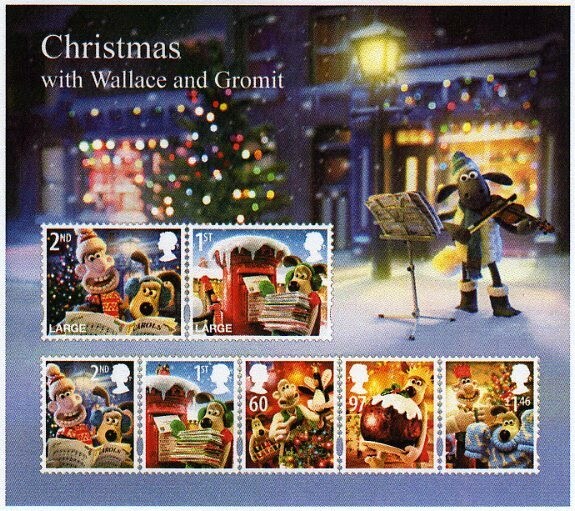 For example, in the 2nd Class stamp design, the lights in the background of the lamp (and on the Christmas tree in the Large 2nd Class design) are real light sources, and the envelope being posted on the 1st Class stamp features a Wallace and Gromit 1st Class stamp. 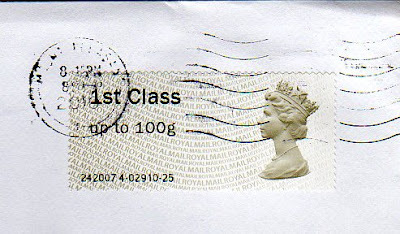 The scenes were then photographed and Royal Mail formatted the images into stamp designs. So what do you think of these? 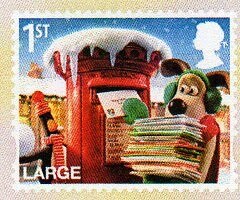 A big seller for Royal Mail, for sure, I would say! Let us know using the Comment link below. Buying individual Horizon labels on eBay isn't something that I ever thought I would do, but I found this RPR label at a low price, so here it is, with a value of 74p for the Recorded Signed For fee. For a full list of the Horizon Service indicators, see this post. 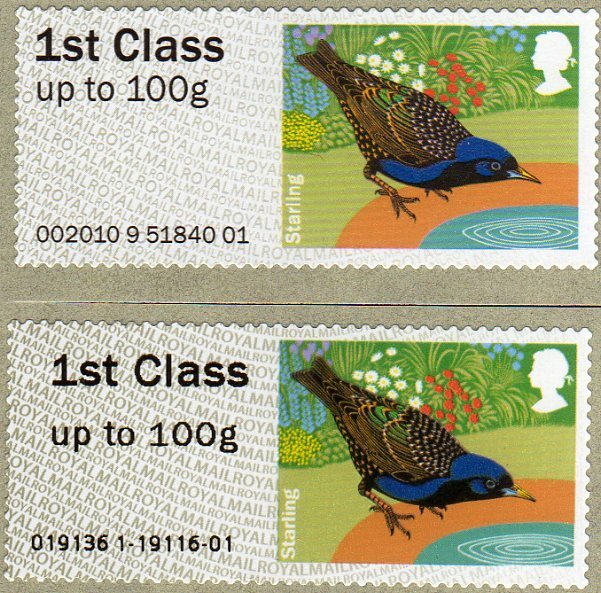 Although the machines' font was changed to match that on the factory-printed Bureau supplies, they are still quite distinguishable, both in the service indicator overprint, and in the Royal Mail background print, although the birds are quite closely matched. 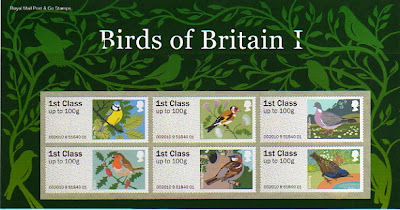 As publicised in our local newspaper, the Eastern Daily Press, the pictorial bird Faststamps were duly nesting in the Post & Go machine at Norwich's central post office in Castle Mall this morning. There were no queues mid-morning and I was able to buy most of what I wanted, only giving way a few times to casual customers who wanted just one set. The machines were originally made to dispense a maximum of 5 labels in a strip, as shown below, which is an actual strip. 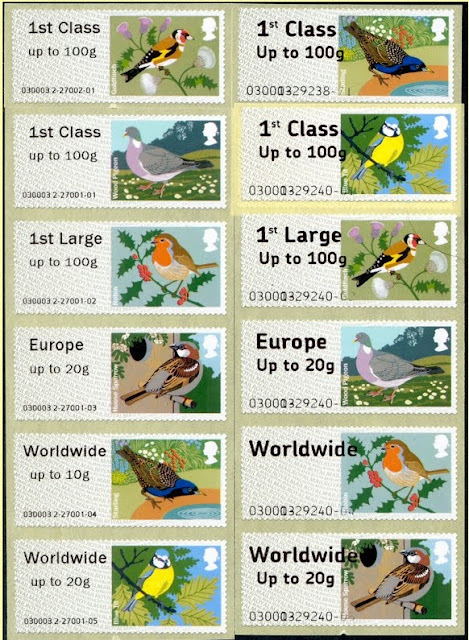 As there are 5 different values many people collected the Machin head in strips of 5, but of course this format leaves us one bird short! You will note that the new font setting results in the 5th stamp on the strip having the branch and session number line dropping into the perforations. The receipt is shown slightly reduced; it is in fact the same width as the labels. Only one of the two machines in Norwich has the new stamps. I was told this was to give customers a choice as business customers may not want the bird pictorials. Given the convenience of these machines, I would think they would be pleased just not to join the queueing system for the counter - although it works much better than the old system did! First Day covers and sets of Birds 1 Faststamps are now available for purchase from our online shop. This link will also show other bird products. My postmaster told me this afternoon that instructions had been issued for the withdrawal - at least temporarily - of the 'perforated' Machin Horizon labels in favour of those trialled at Old Street (and more recently at Chesterfield). 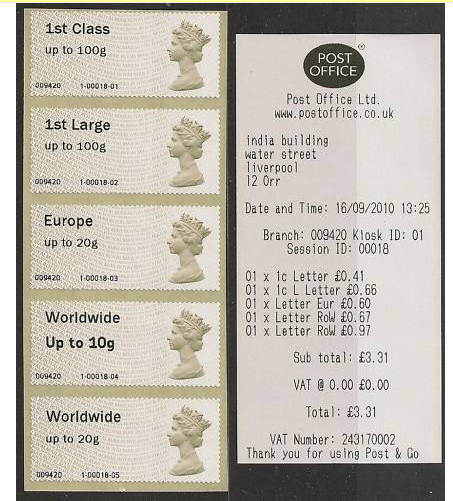 I've no official word on this yet, and it may be that Post Office Ltd are seeking a solution to the counters printer problem that resulted in the new type of label. 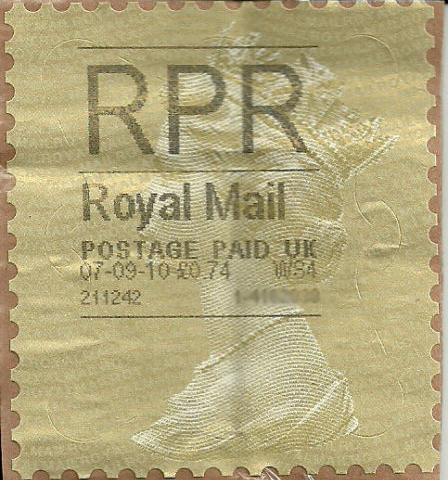 But it may be that some offices will never use the perforated ones, and that some service indicators on these will be - to say the least - unusual. The PostagelabelsUK blog reports today that Post & Go machines are being modified in preparation for the issue on 17 September of the Bird Pictorial Faststamps. On the examples shown, the font is quite different, the uppercase on Up to 100g has changed to lower case up, and the g in both Large and g(rammes) has changed to the traditional style shown in our normal type-face (g) from the Arial style g. Whether or not you can see this here may depend on your browser settings - click on this link to see examples. We don't have any of these for sale, but hope to have some from the Norwich machine before the rolls of Birds stamps are installed. 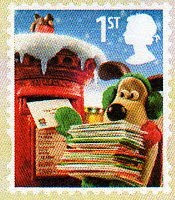 Royal Mail has announced a further addition to the Commemorative Sheet programme this year. The National Arboretum is the national centre for Remembrance and at its heart is the Armed Forces Memorial. This, and many of the commemorative sculptures at the Arboretum are featured on the sheet and the accompanying folder. 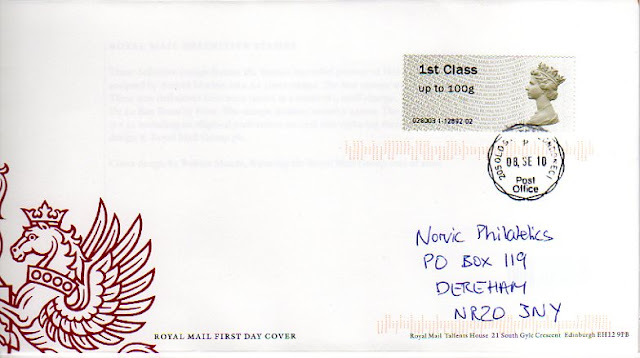 Royal Mail will be making a donation to the National Memorial Arboretum for each one sold. 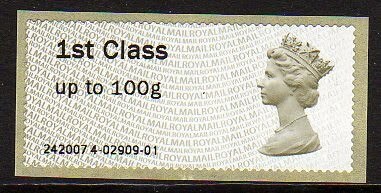 Royal Mail Stock Code will be AV012, and the price £13.50. 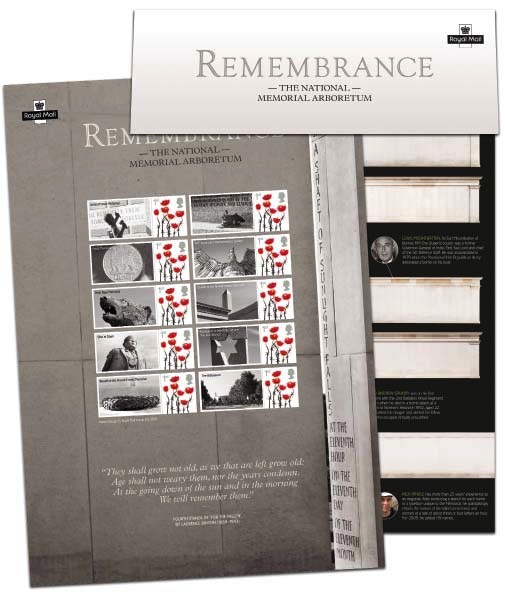 What do you think of Commemorative Sheets - do you buy them? Good for stamp collectors, or just good collectables for Royal Mail? Use the comments button - comments can be anonymous.